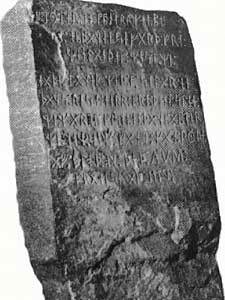 "The Kensington Runestone is a 200-pound (90 kg) slab of greywacke covered in runes on its face and side. A Swedish immigrant, Olof Ohman, claimed to have discovered it in 1898 in the largely rural township of Solem, Douglas County, Minnesota, and named it after the nearest settlement, Kensington. The inscription purports to be a record left behind by Scandinavian explorers in the 14th century (internally dated to the year 1362). There has been a drawn-out debate on the stone's authenticity, but the scholarly consensus has classified it as a 19th-century hoax since it was first examined in 1910, with some critics directly charging the purported discoverer Ohman to have fabricated the inscription, although there remains a local community who remain convinced of the stone's authenticity."